Don’t you love your slow cooker? I absolutely do, and often think that I don’t utilize it enough. I’ve shared a Hearty Beef Stew recipe on my blog a while ago (click here for that recipe). Today, I wanted to share another favorite slow cooker recipe with you: Asian Style Pork Ribs 簡易慢燉鍋香辣排骨! These Asian Style Pork Ribs are so easy to make. Check out the step-by-step video tutorial at the top of this post and you’d agree! These ribs are also aromatic. The soy sauce and Korean Chili Paste (Gochu-jang) give these ribs the deep savory and slightly spicy flavors; the brown sugar gives them a hint of sweetness which balances well with the savory soy sauce; the orange juice truly brightens up the flavors of these ribs too! There are quite a few ingredients on the list but they are all basic Asian pantry essentials. If you love Asian recipes, these ingredients would be wonderful starting points to stock your pantry and get cooking. These ingredients are usually available in most supermarkets, or Asian markets. I’ll list the ingredients and where to buy at the end of the post for your reference. Forget about take outs! This recipe is so simple that you can basically get all the ingredients into the crock pot in the morning, and then relax and enjoy a wonderful dinner with your family after a long busy day. These Asian Style Pork Ribs are absolutely finger licking good! With a side vegetable dish and some steamed rice, you’re good to go! Give them a try and I’m sure you and your family will love them as much as my family does. I adore Sakura (Cherry Blossom)! One of my dreams is to visit Japan in Spring to enjoy the scenery when the Sakura blooms! Since I don’t think that is going to happen any time soon, enjoying a slice of this Sakura Swiss Roll Cake 櫻花瑞士卷蛋糕 is as close as I can get my hands (or taste buds) on them! If you’ve tried my other Swiss Roll recipes, such as this Decorated Coffee Swiss Roll, Strawberry and Cream Swiss Roll, or Chocolate Yule Log, you probably know that my roll cake recipes are pretty much fool proof. What is the biggest nightmare when making a roll cake? I’m sure any baker would tell you that having a cracked up cake when you try to roll it up is the baker's biggest fear! So, give my recipes a try and you’ll be amazed by how soft and spongy the cake is, which makes it super easy to roll up! Watch the YouTube video tutorial at the top of this post and you’ll see what I meant. I used some pickled sakura to decorate this cake. Beside adding a little pattern and decorations on the cake, the pickled sakura also adding a hints of tartness and unique flavors to this cake (the flavor is similar to the Chinese sweet and sour plums). I also added some sakura paste into the cake batter and fillings. It’s tart and sweet at the same time, and packed with wonderful sakura flavor which I adore. The subtle floral aroma is beautiful in this gorgeous cake. Check out the list of tools and ingredients at the end of this post to find out where to get them. I hope you’ll give this cake a try soon. It sure feels like Spring time arrived early in my kitchen! Thank you everyone who participated in the Ultimate Friendship Bracelets Kit giveaway. Special thanks to Tuttle Publishing for providing the prize. We have selected a winner through Random.org! Congratulations, An ika! I’m sure you will enjoy this kit a lot! I’ll be in contact with you soon. If you didn’t win the giveaway, you can still purchase a copy of the Ultimate Friendship Bracelets Kit here. It’s a wonderful that you can enjoy with your kids. Home Sweet Home 3D Sugar Cookies – For Valentine’s Day! Another Valentine’s Day treat? Why not? Especially when they are as adorable as these Home Sweet Home 3D Sugar Cookies! Check out the step-by-step video tutorial above and find out how to make them. They are super easy and you can decorate them however you like it. I’ll list the tools that I used at the bottom of this post for your reference. This post is actually a dedication to my Hubby for Valentine’s Day! I might not have said it often enough, but I sure hope that he knows how much I appreciate and feel grateful for everything that he did for the family. He is always very supportive and encouraging, especially when it comes to my work. He taught me by example to be patience and have faith with the kids. He works hard to provide for the family so I can work part-time from home and do what I love. Because of him, we have this place that we feel loved and secured, a place that we can called home….a Home Sweet Home, in deed! Now, you see why I created these cookies for Valentine’s Day! I actually used a 3D gingerbread house cookie cutter for these sugar cookies. But who said I have to make gingerbread cookies in February, right? I love that I can use the cookie cutter for more than just one thing! There are many ways you can decorate these cookies too. Besides using the 3D gingerbread house cookie cutter, I also used a mini flower and heart shaped cookie cutters to decorate these houses. You can also use sprinkles (see the 1st picture above), or colored sugar to garnish them as well. And of course, you can put them in treat bags and give them out to your Valentines! They made wonderful homemade treats for sure. Be prepared to hear oohs and aahs when you hand them out. Thank you for stopping by today. I hope you enjoy today’s post, recipe and video tutorial. Stay tuned for more fun recipes in the near future. Happy Chinese New Year (恭喜發財)! 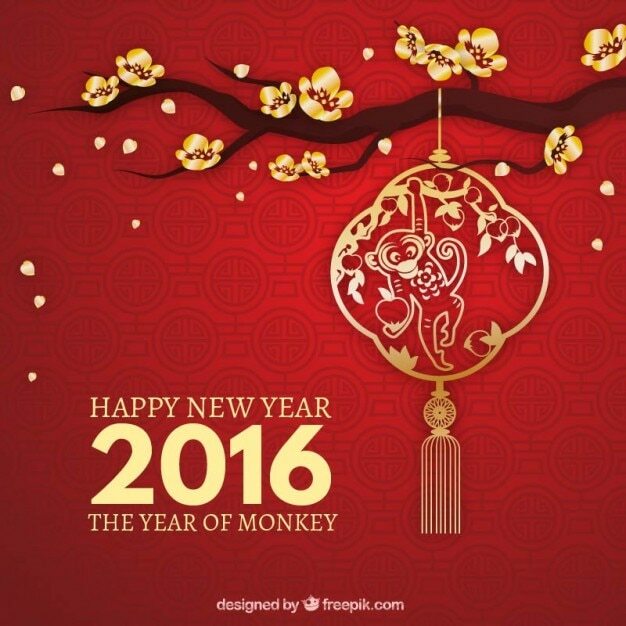 February 8th marks the first day of the Year of Monkey in the Chinese Zodiac. I want to wish you all a healthy, wealthy, and prosperous year! 猴年祝大家新年快樂, 身体健康,步步高升! 財源滾滾來! 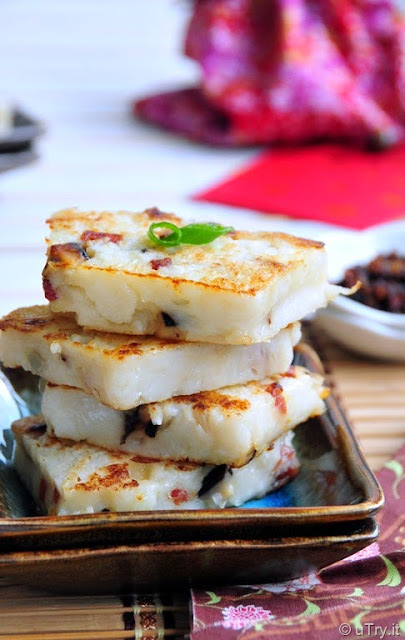 Last week, I made some Chinese Turnip Cakes (港式臘味蘿蔔糕) to share with the family. This is one of the Chinese New Year must-have treats! Click here for the recipe. Seems like we’re having warmer than usual temperature for CNY this year in L.A. 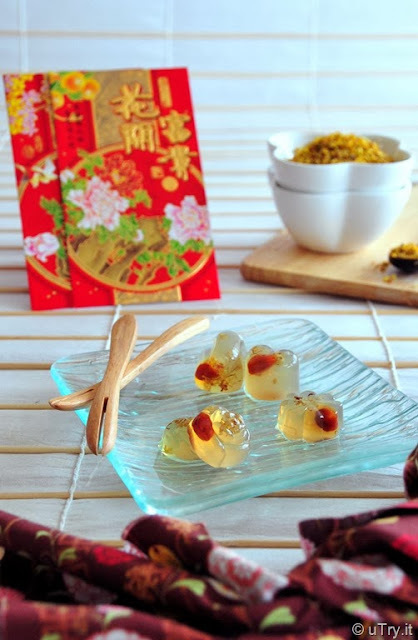 So, these Osmanthus Jelly with Goji Berries (杞子桂花糕) are perfect for the occasion! Another savory treat that I love are these Chicken Pot Stickers (雞肉鍋貼). Their shape resembles the golden nuggets people used for trading in the ancient time. So, serving these Pot Stickers around CNY is a symbol of wealth for the new year to come! I recently made a pork and cabbage fillings version of these dumplings and they were so good. Can’t wait to share the video tutorial with you soon. Of course, you can’t skip dessert for a happy CNY feast! 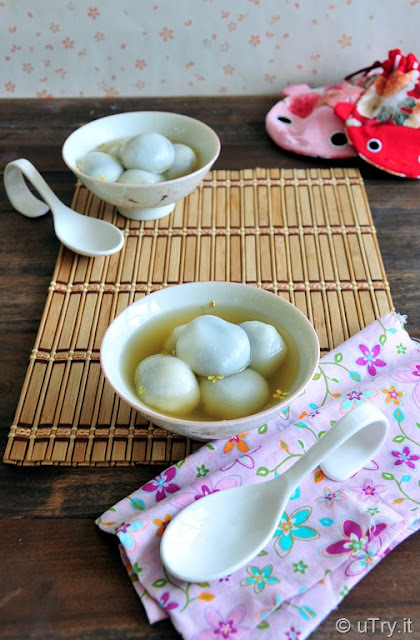 These Black Sesame Dumplings with Ginger Syrup (薑茶芝麻湯丸) is the perfect treat to conclude a meal. The round shape of the dumpling represent the unity of the family. For more authentic Chinese New Year treats and recipes, simply click here to check them all out! Thank you so much for stopping by! Once again, Happy Chinese New Year everyone 恭喜發財! Stay tuned for a more fun recipe and video tutorial on the blog soon!